A-HOTEL.com - Luxury and cheap accommodation in Pavlovsk, Russia. Prices and hotel, apartment booking in Pavlovsk and surrounding. This indicative offer was derived from the most recently booked accommodation in Pavlovsk and sort by the price, from cheapest Pavlovsk accommodation to the most expensive hotels. To select accommodation by your preferences we recommend to choose from 4 accommodation offers in Pavlovsk in total. By entering the dates of your overnight stay in Pavlovsk and using the filter tools you can sort the best possible accommodation for you. The entered dates of your stay are crucial for the most accurate offer as it derives all the online information on pricing and availability of Pavlovsk accommodation. Then you can book the selected Pavlovsk lodging (hotels, apartments etc.) immediately. Modern History Apartments features accommodation in Pavlovsk.100 meters away from Pavlovsk Park and 250 meters from Pavlovsk Palace. Hotel Zamok BIP is offering accommodation in Pavlovsk. Among the various facilities of this property are free bikes, a garden and a terrace. Boasting accommodation with a balcony, Аппартаменты на Слуцкой is located in Pavlovsk. Guests staying at this apartment have access to a fully equipped kitchen. Павловск is situated in Pavlovsk. This apartment provides a garden as well as a terrace. Flatstar on 1-oy Sovetskoy enjoys a location in Saint Petersburg, just 8 km from Aleksandrovsky Park and 31 km from The St. Petersburg Masterskaya Theatre. Set in Pushkin in the Leningrad region, Apartments on ul Architectora Danini 1/19 has a terrace. The Tsarskoye Selo is within 3. Located 3.8 km from Tsarskoye Selo in Pushkin, Apartment Three Parks offers accommodation with a kitchen. Apartments na Malinovskoy 17 is situated in Pushkin, 3.3 km from Tsarskoye Selo, 3. Located 5 km from Aleksandrovsky Park in Saint Petersburg, Apartment Danini offers accommodation with a kitchen. This apartment also features a restaurant. 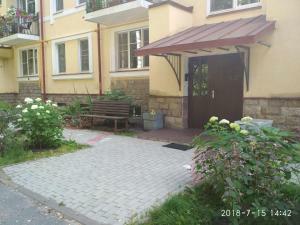 Apartment Rosa36 is situated in Pushkin, 3.3 km from Tsarskoye Selo, 3. With garden views, Апартаменты Симпатико Инкери is set in Pushkin and has free WiFi. Featuring a kitchen with a microwave and a fridge, each unit also comes with a satellite flat-screen TV, ironing facilities, desk and a seating area. 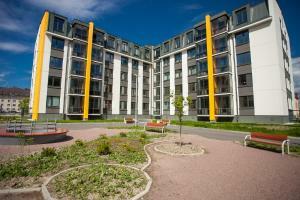 Супер эконом enjoys a location in Pushkin, just 3.3 km from Tsarskoye Selo and 3. Located in Pushkin, 3 km from Tsarskoye Selo, 3.3 km from Catherine Palace and 3. Featuring a children's playground and luggage storage space, Pushkin-Sofia is conveniently situated in Pushkin, 3 km from Tsarskoye Selo and 3 km from Catherine Palace. The property, housed in a building dating from 2018, is 3. Offering free WiFi and garden views, Apartment on Krasnoy Zvezdy 8 provides accommodation located in Pushkin, just 1.7 km from Tsarskoye Selo. Friedental Hotel is located in a residential building in Pushkin and has a separate entrance. The Royal Cathedral, Tsarskoe Selo Lyceum and Catherine Palace are only a 10-15 minute walk. Located in Pushkin, Мини-отель у института Турнера provides free WiFi, 2.9 km from Tsarskoye Selo and 3. Boasting a terrace, Victoria Apartments offers accommodation in Pushkin, 2.7 km from Tsarskoye Selo and 2. Aksinya is located in Pushkin, a 5-minute walk from the Sophia Cathedral, Turnera Institute and Ekaterininsky Park. Free WiFi access is available. Apartments u Orlovskikh Vorot is a property with a garden located in Pushkin, within just 700 metres of Sophia Cathedral and 700 metres of Chesmenskaya Column. Housed in a building dating from 2015, the apartment is in an area where guests can engage in activities such as skiing and table tennis.